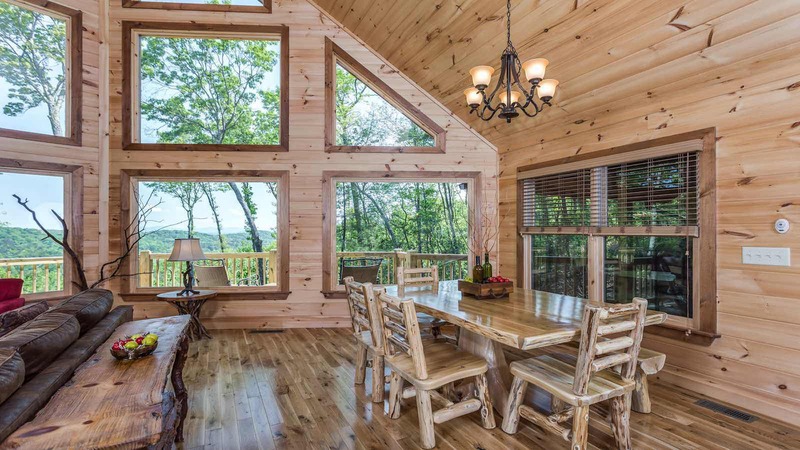 If you’re looking for a luxury cabin with serenity and gorgeous mountain views then Mountain Top Serenity is the cabin for you! 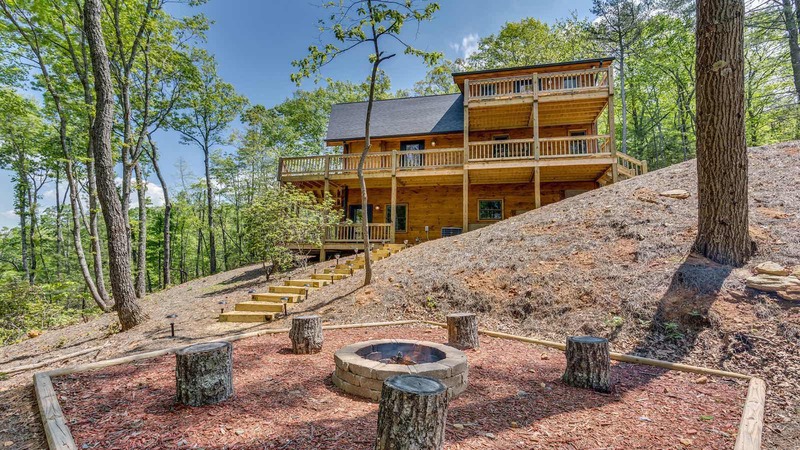 This newly constructed 3 bedroom, 3.5 bathroom luxury cabin is located only 15 minutes from Downtown Blue Ridge in the famous Aska Adventure Area. 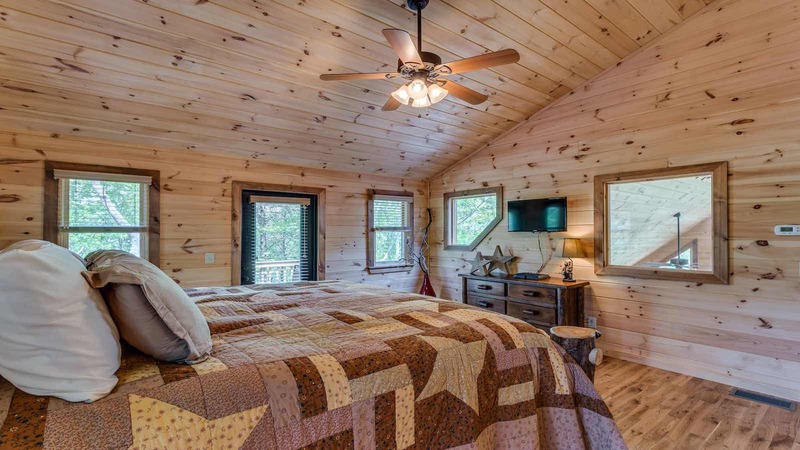 This cabin has the sought after prowl front windows facing the 180 degree mountain view as well as many more windows for viewing the rolling mountains and hills of beautiful Blue Ridge. 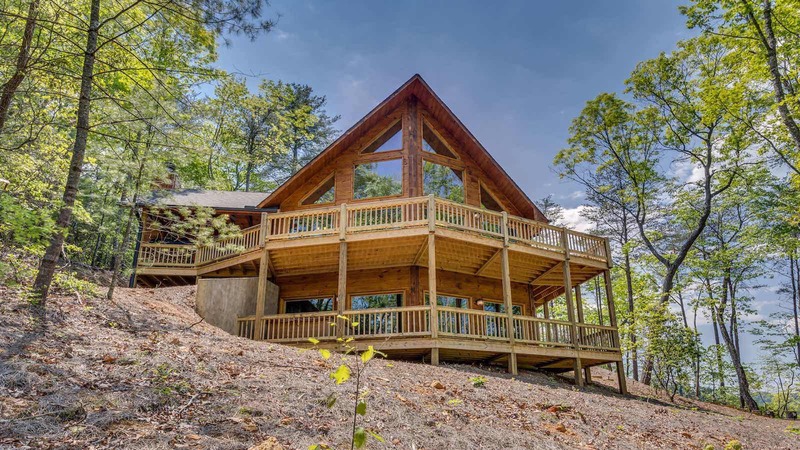 Enter the driveway of the cabin and access the main level by just a few steps onto the wrap around deck. 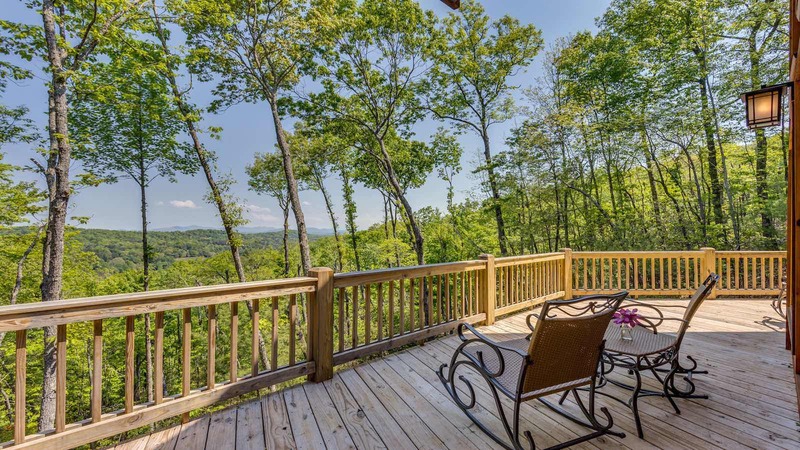 This deck continues around the front of the cabin to the prowl front windows facing the mountain view and then the main level outdoor living space. 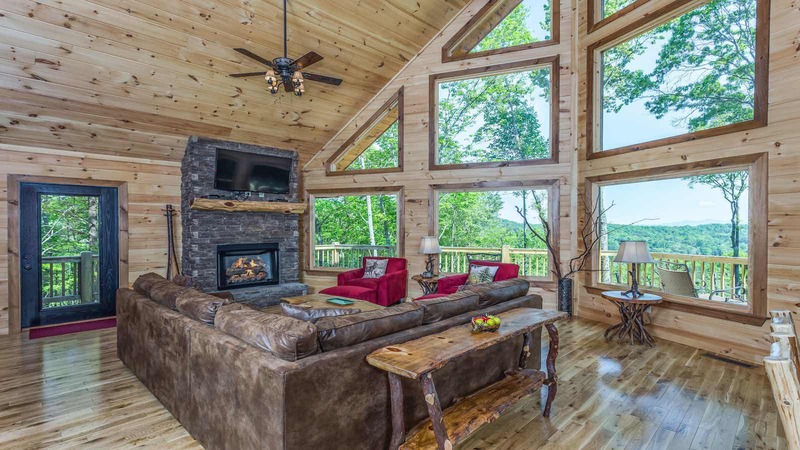 The lain level outdoor living space has patio seating, a gas grill, and floor to ceiling beautiful wood burning fireplace, topped with a gorgeous rustic mantel. 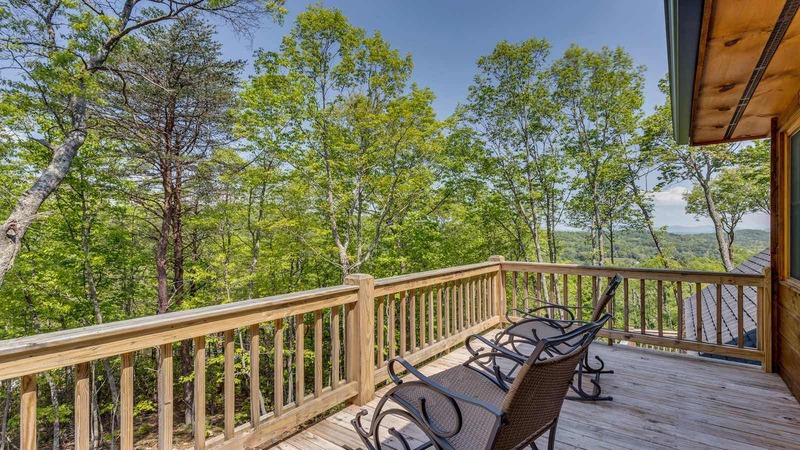 This area is ideal for breakfast overlooking the mountains or evening meals with friends by the fire! Step inside to explore the gorgeous main level! 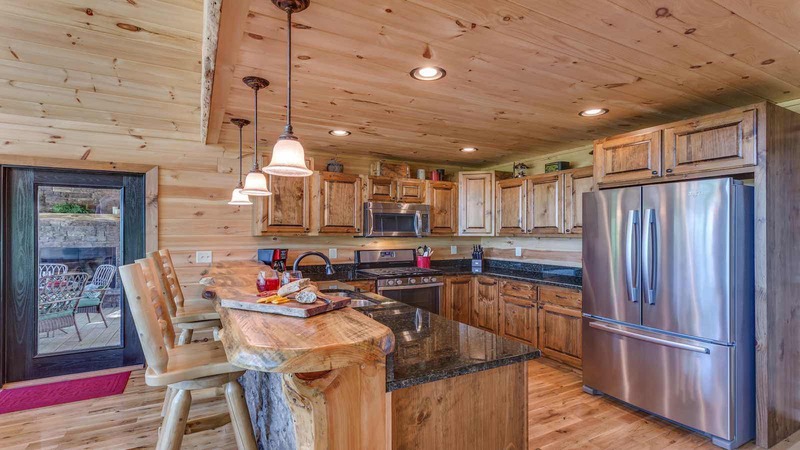 The kitchen has a rocked bar with two bar chairs, granite counter tops, and stainless steel appliances. 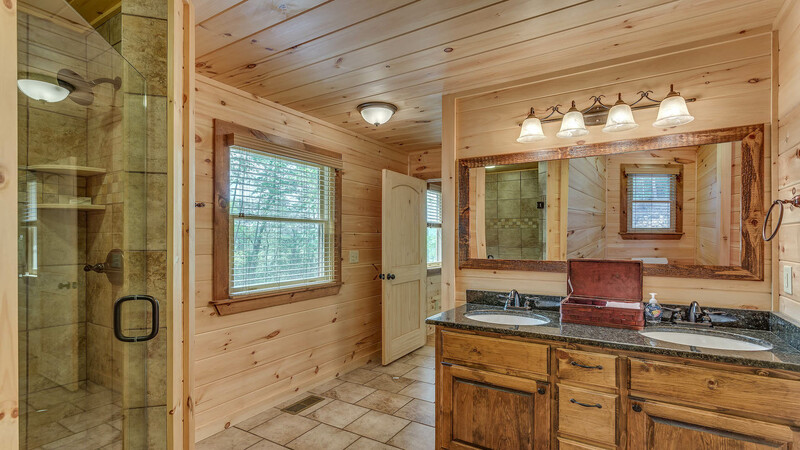 Just to the right of the kitchen is a useful half bath/powder room. 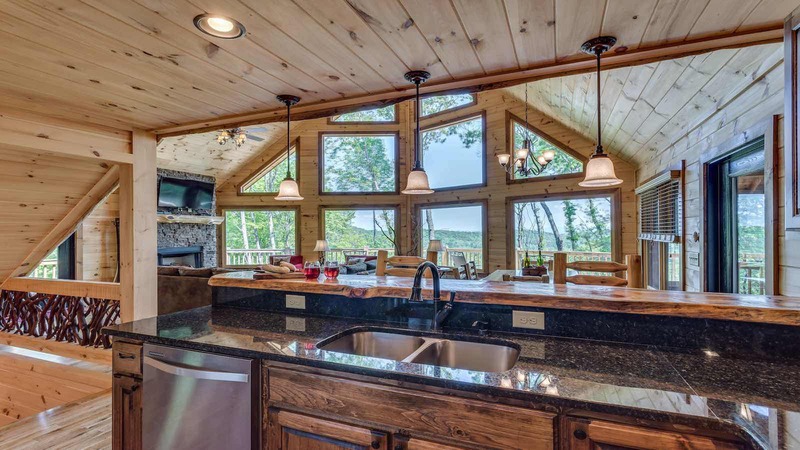 The open living space has a lovely dining table with seating for 6 adults next to one of the many windows with mountain views. 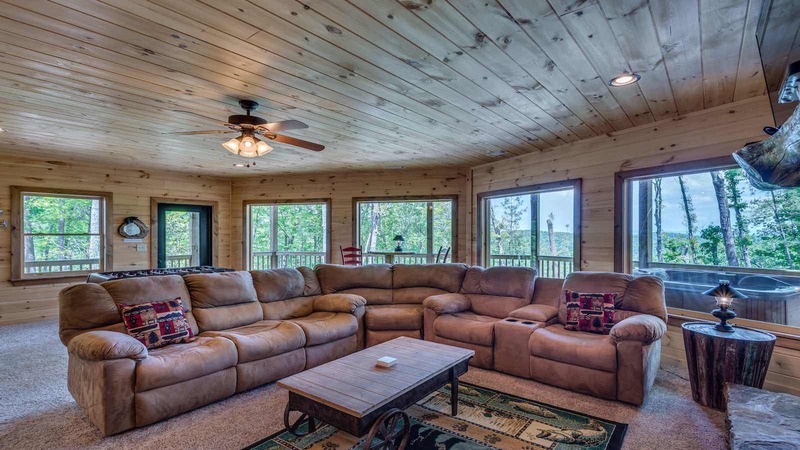 You can also enjoy the large flat screen TV mounted on the rustic log mantel of the floor to ceiling stone gas log fireplace while sitting in one of the cozy chairs or the comfy sofa. 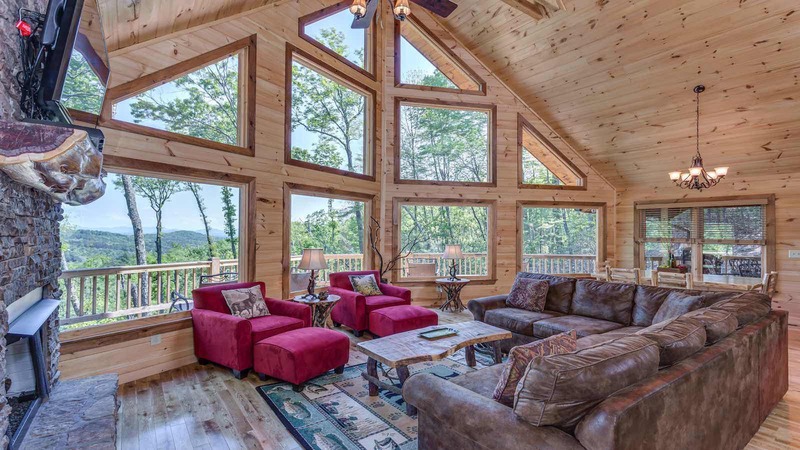 From the sofa you can also catch up on reading or just have a cup of coffee as you gaze through the wall of windows. 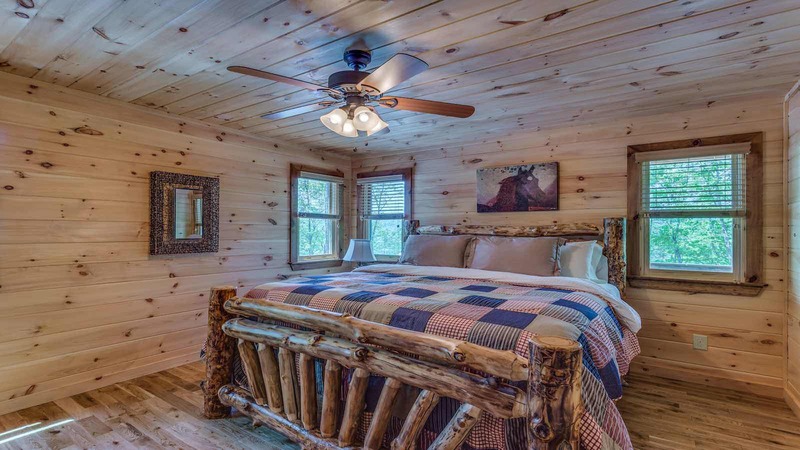 The main level bedroom is just a few steps away, which has a king size log bed with a flat screen TV mounted to the wall and a private bathroom. 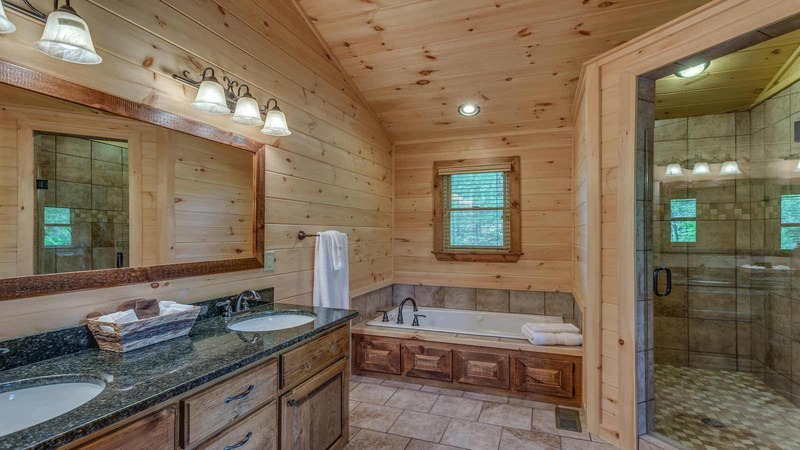 The bathroom adjacent to this bedroom has a tile shower and double vanity granite counter top sink. 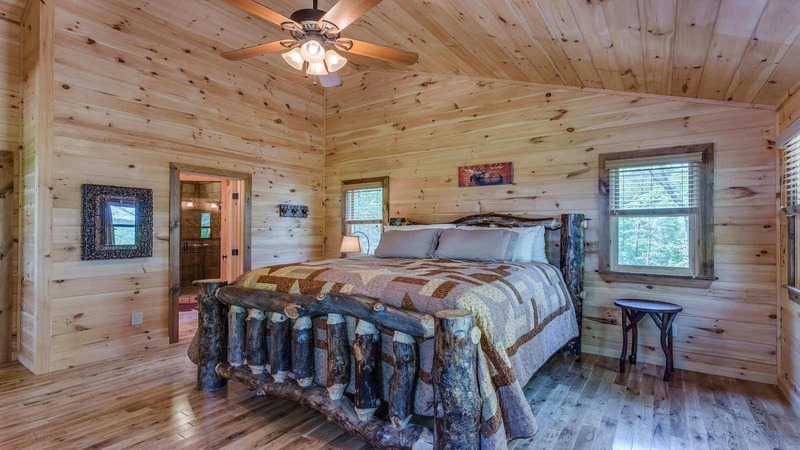 Up the genuine reclaimed Mountain Laurel staircase, you’ll find the master suite. 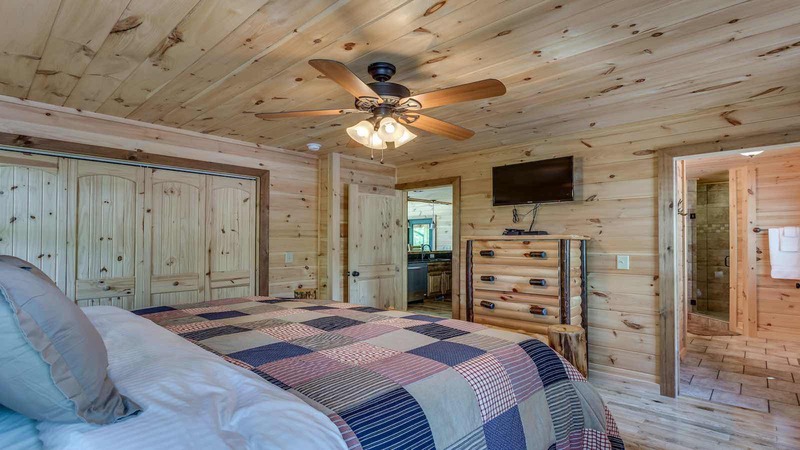 The master bedroom boasts a massive King size bed with a flat screen mounted to the wall, a balcony overlooking the mountains and outdoor fire pit, and a wonderful master bathroom! 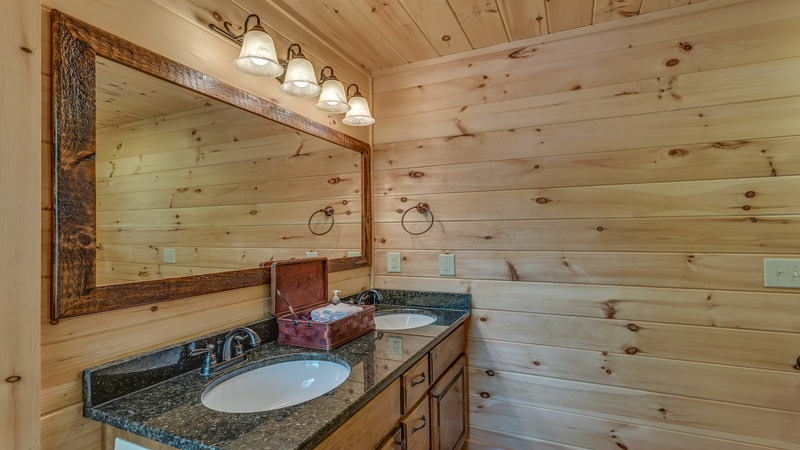 The master bathroom has a tile shower, double vanity granite counter top sink, and a garden tub ideal for relaxing after a long day. 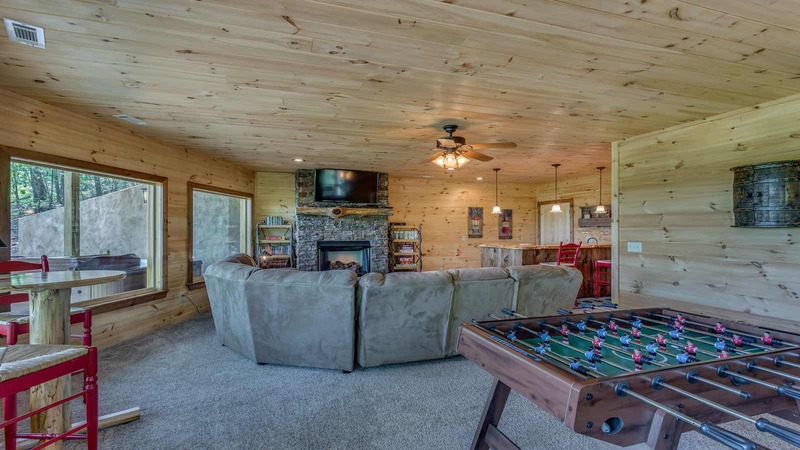 Head to the finished basement level for some fun and games! 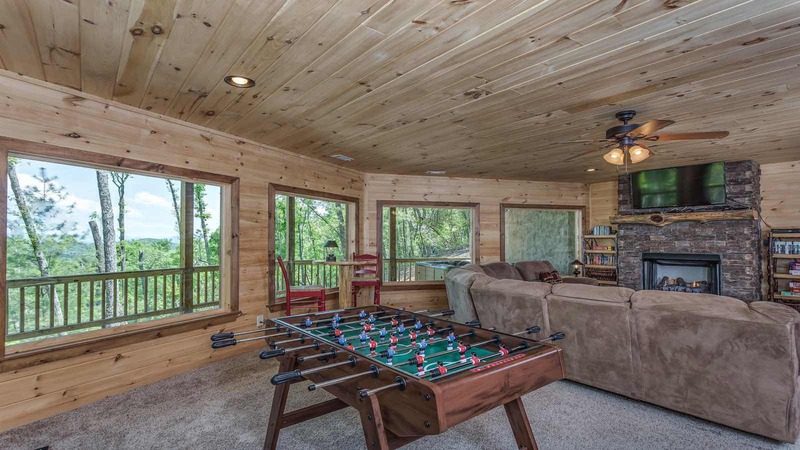 The basement game room has a foosball table, a rustic wet bar with stools and mini fridge, a stone gas log fireplace, a big sectional sofa, and pub table with two chairs. 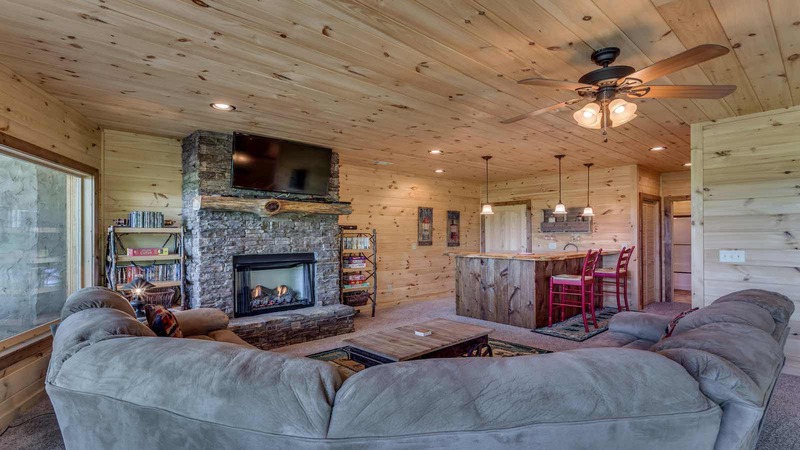 A large flat screen TV accompanies the fireplace, which ideal for movie night by the warm fire! 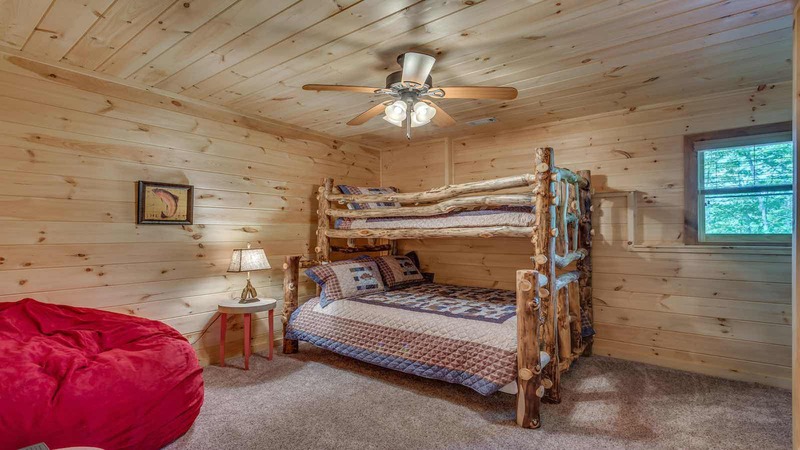 The 3rd bedroom is on this level as well, which has a wall mounted flat screen TV, a plush bean bag chair, and set of bunk beds: a Queen size bed on bottom, and a Twin size bed on top. The 3rd bathroom is also on this level next to the bedroom. 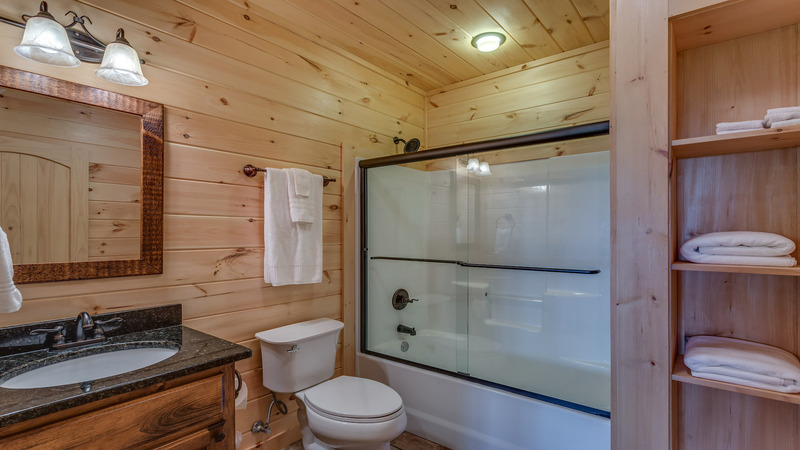 This bathroom has a single granite top sink with a modern sliding glass door tub/shower combo. The amenities don’t end inside the gameroom level! 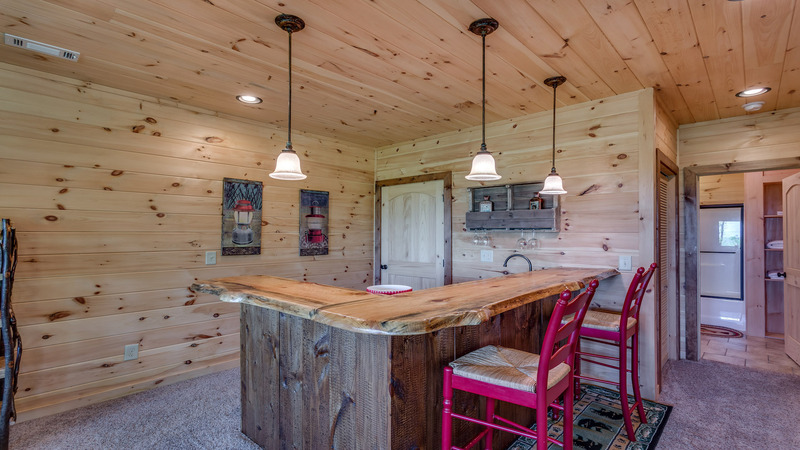 Outside the finished basement game room level you’ll find the bubbling, warm hot tub just waiting for you to jump in! 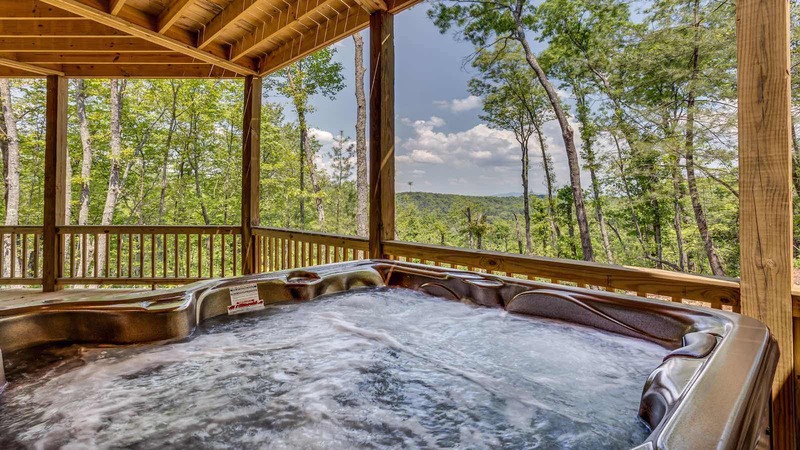 The hot tub is positioned to enjoy the 180 degree mountain view as you soak your stress away. 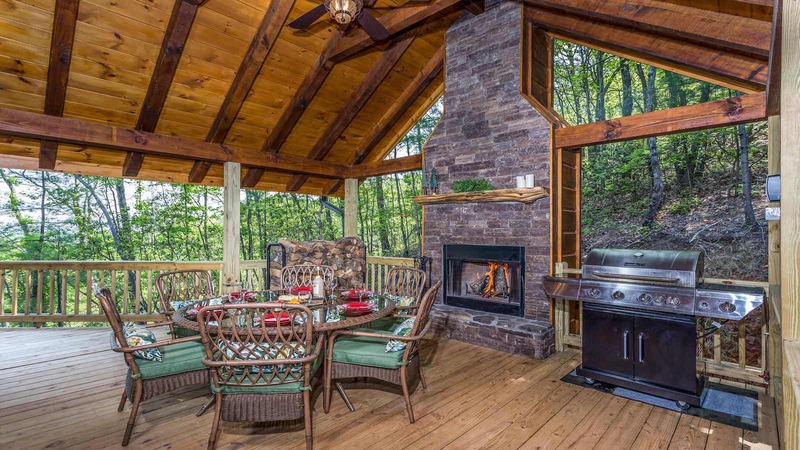 If you’re ready to roast some marshmellows, take the landscaped steps to the firepit area. The fire pit is perfect for storytelling, trips down memory lane and making new traditions. 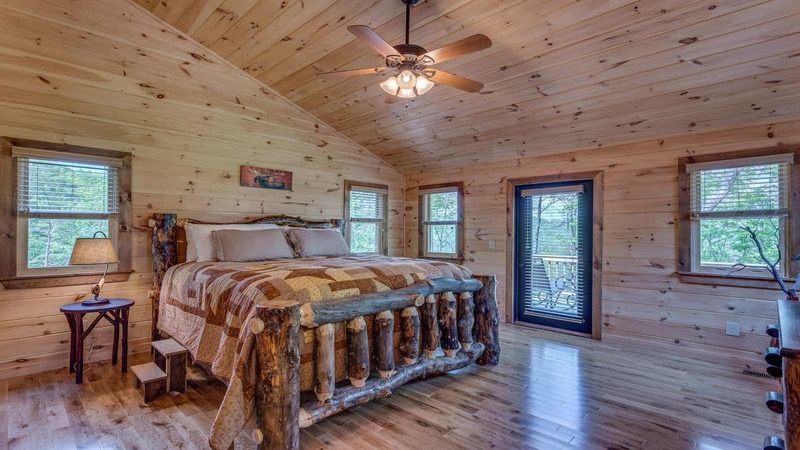 No matter what you’ve got in mind for your vacation, Mountain Top Serenity delivers. 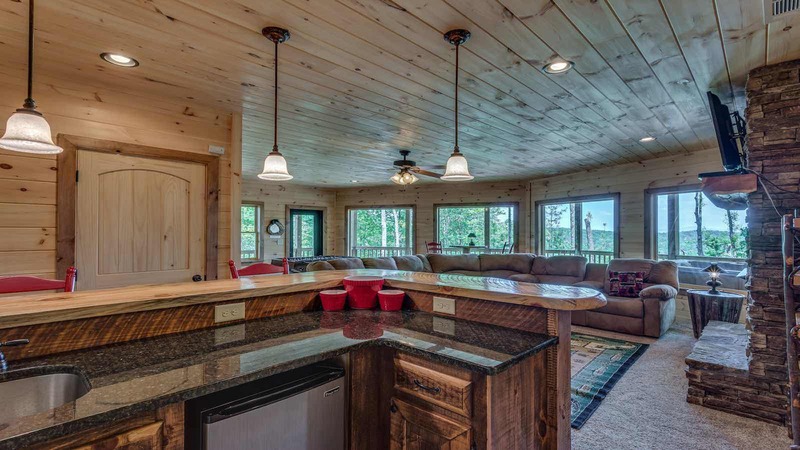 This cabin is perfect for reconnecting, couples getaways, making new memories, enjoying family & friends, or just plain relaxation!